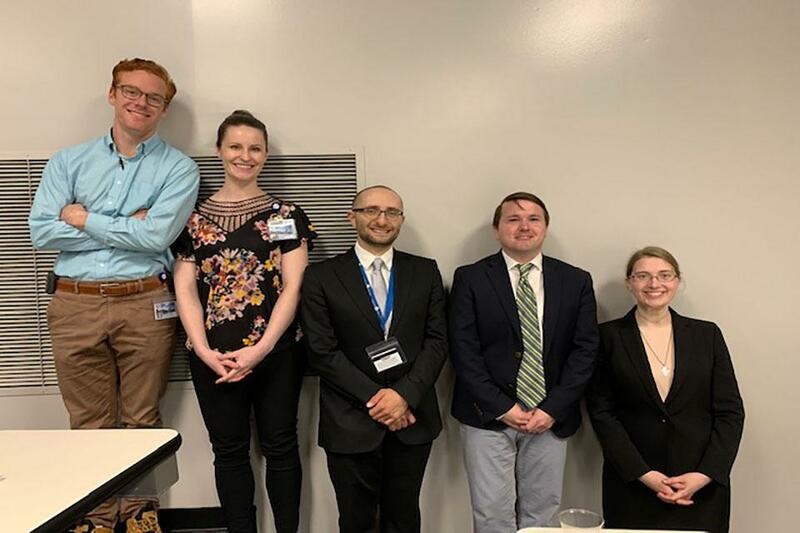 The Saint Louis University School of Medicine Graduate Medical Education Office provides support for a limited number of away electives for resident training. These rotations are intended to enrich the educational experience of a resident and the residency training program, expand SLU's visibility locally and internationally, and create unique opportunities for residents to provide care to the underserved. Applications are reviewed twice each year and must be received by May 1 or November  1. For a full description of the Program for Away Rotation program,  download the guidelines. The financial structure of Medicare Graduate Medical Education training requires residents to work physically within the hospital system that provides the financial support for the educational experience. Resident rotations away for special educational activities, volunteering for underserved populations and international experiences are not supported through traditional GME cost report funding. It is difficult to arrange away rotations, even within the same city, without dedicated financial support. Many Saint Louis University faculty volunteer clinically outside of the United States and would welcome resident participation but lack a financial mechanism for such rotations. Prospective residents often ask about international or away electives during the interview process and indicate that the Saint Louis University mission of service is a reason for selecting our school and residencies. Many desire the opportunity to provide additional care to the underserved, generally outside of the United States, as a part of the training program. Some residents also desire specialized educational opportunities that are not available at our School or affiliated training hospitals. These rotations away require external stipend support not available through the current hospital or GME training budgets. Each academic year, selected residents will be allowed to engage in training outside of the Saint Louis University affiliated sites for a maximum of four weeks each. This is a competitive process which requires an application, approval and supporting documentation. A committee will review the application and determine if funding and support will be provided by the GME office for this experience. Applications must be received at least two months in advance of the expected training period. Up to 28 days (approximately $5,000) per resident will be covered through the GME office for stipend, benefits and malpractice coverage (if U.S.-based rotation) during the away rotation. An additional travel allowance of up to $1,000 will be provided to offset a portion of the cost of airfare/transit to an international location and up to $500 to a U.S.-based location. Trainees remaining in St. Louis will not receive a travel allowance. When partial existing funds are available for a rotation or travel, partial support may be provided by GME to offset unfunded expenses. The resident or program will be responsible for lodging, meals, required vaccinations or prophylactic medications, incidental costs, and fees associated with processing, licensing or credentialing at the away site, purchasing of international health insurance (mandatory) or additive malpractice coverage (optional). The resident's training program will be responsible for any programmatic costs associated with the trainee's absence. International health insurance is available for a minimal cost through Saint Louis University via the SLU Marketplace website. This program will neither replace established funding mechanisms for resident away rotations, nor fund experiences that are a required component of the residency training program. This program is intended to provide support for unique opportunities, resident-initiated experiences, or initial development of international training partnerships for resident education. This program is not intended to fund established or annual "senior year" away rotations for a department/program. External or departmental support is expected for recurring away experiences. Denial of funding through this GME-supported program does not imply denial of approval by the GME office for the away experience; other funding mechanisms should be pursued. Each training program may submit up to two applications for consideration during an academic year. Applications and supporting documentation must be completed before being considered by the review committee. Applications must clearly demonstrate the educational benefit to the trainee and program and the support of the program director and department. Upon return from the rotation, the trainee will be required to provide an educational presentation of the experience, complete a post-rotation report for the GME office and serve as a resource for other trainees who may be interested in away rotation experiences. A local faculty adviser and an off-site supervisor must be identified for each away experience. The adviser will be responsible for assisting the resident with the application process, obtaining necessary supporting documentation, monitoring the resident's participation in the away rotation and ensuring an evaluation of the resident takes place. The off-site supervisor must complete an end-of-rotation evaluation and agree to the term established for the away rotation. The resident, faculty adviser and program director are responsible for all planning, paperwork and travel arrangements. A rotation description including goals and objectives, clinical responsibilities, and the supervision and evaluation process must be created by the program director, and an evaluation of the trainee must be performed at the end of the experience by the supervising clinician. When required, the program director must submit a program letter of agreement between Saint Louis University and the away site which outlines the resident responsibilities, educational activities, and supervision structure of the away rotation. The program director must complete any paperwork required by the away rotation site at least one month in advance of the start of the rotation. The away rotation must not place undue clinical or service stress on other trainees or compromise patient care. Participating residents must not be required to extend residency training by participating in the away rotation. The away rotation must provide a certifiable educational experience as outlined in the Accreditation Council for Graduate Medical Education (ACGME) Resident Review Committee Program Requirements for the trainee's specialty. The away rotation cannot take place in a restricted location, site of military conflict or area which would place the trainee in physical danger. 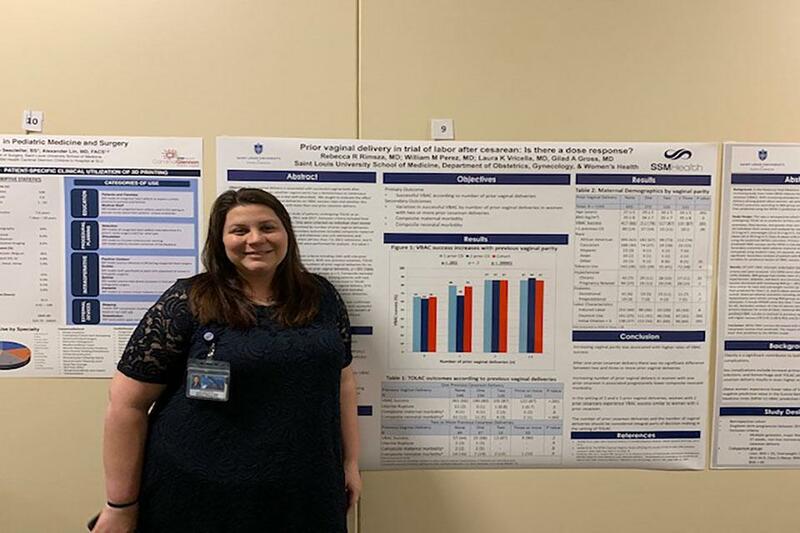 Each year, residents/fellows are encouraged to participate in our annual House Staff Research Symposium Poster Competition. Prizes are awarded to the four oral semifinalists, best at-poster discussion, and best quality improvement poster. 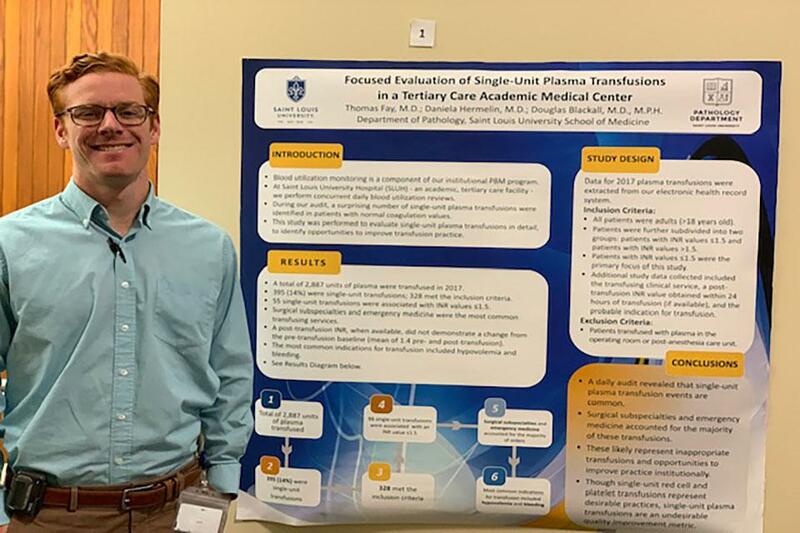 The research on which the submitted poster is based may have been conducted over the last two years; and may also have been presented outside the University, but may not have been presented at a previous SLU House Staff Poster Competition. Rebecca Rimsza, M.D., obstetrics/gynecology: Best At-Poster Discussion. Physician recipients and nominees live out the ideals of our mission in their practice. All attending physicians, fellows and residents who practice at SSM Health Saint Louis University Hospital and who have not received the award in the last seven years are eligible for nomination. Nominations can be sponsored by residents, fellows, medical students, program directors/coordinators and clinical staff. Repeated nominations will be accepted, however prior awardees are not eligible for repeat awards during the same academic year. Nominations will be reviewed and selected at least quarterly by members of the Graduate Medical Education Committee and will receive recognition and a monetary award. Daniela Hermelin, M.D., a blood banking and transfusion medicine fellow, demonstrates exceptional patient advocacy that extends well beyond the immediacy of the patient-physician interaction. With a patient who had a difficult-to-manage condition, she advocated for the well-being of the patient by addressing complicated transportation issues, making sure the necessary medications are always available at the patient’s preferred pharmacy, and serving as the interface with the patient and neurologist on multiple occasions. Her caring disposition has had a tremendously positive impact on this patient’s complicated clinical situation. Dr. Hermelin is an unparalleled system navigator for her patients. Douglas Snyder, M.D., an internal medicine resident, is a strong advocate for his patients and always goes the extra mile. When Dr. Snyder was called to assist a co-resident with a difficult patient situation regarding insurance, he learned that the patient had tested positive for HIV earlier in the day. He spent nearly two hours providing support and comfort to the patient assuring the patient that the diagnosis of HIV was not a death sentence. Not only did Dr. Snyder put the patient at ease about the diagnosis but stayed after hours to help tailor the patients other medical condition for insurance. He was able to find a regimen for the patient that was $0 out of pocket cost. Mudasir Kamal, M.D., a psychiatry resident, goes above and beyond the call of duty to ensure quality patient care. He is effective at using the patient-centered approach to connect with patients even the most challenging personality disordered patients that others find difficult and has created extra patient slots outside his regular work hours to help patients in dire need. In addition, Dr. Kamal helped establish the first student-run psychiatry clinic and was instrumental in helping patient without insurance obtain treatment for mental illnesses. He takes challenges with a smile and provides a positive patient experience. Aliza Machefsky, M.D., an obstetrics/gynecology resident, provides exceptional, compassionate care to all our patients. She always puts the patient's values, needs, and desires first. She takes the time to talk with her patients in a professional manner that the patient can easily understand. Dr. Machefsky spent many hours with a mother who was delivering premature twins. This was an emotionally difficult time and the mother asked Dr. Machefsky to continue caring for her in the hospital. Dr. Machefsky put the patient's needs ahead of everything else to spend additional time with this mother. Samkon Gado, M.D., an otolaryngology resident, is a true advocate for each patient he sees. He has excellent bedside manner and delivers holistic, innovative, and spiritual care through his outreach to Nigeria and for the patients of our community. Dr. Gado saw a patient with nasal complaints and not only took the time to provide the routine care, but also to explain the dangers of chronic daily opioid use. He personally accompanied a patient to the hospital for admission and took additional time to speak with the family of a disabled patient who needed extra attention for recurrent nosebleeds. Ashley Meyr, M.D., a family medicine resident, is not satisfied unless every stone has been turned to get answers and appropriate care for her patients. She is thorough, thoughtful and diligent and will track down patients who do not come to appointments. Dr. Meyr guided a non-English speaking immigrant patient through a complex and confusing medical illness that required multiple biopsies to determine the final diagnosis. She did not stop looking for the correct diagnosis despite initial negative testing. The patient's husband is also now coming to Dr. Meyr for his primary care. Jenna Fine, D.O., a pediatric critical care resident, consistently provides life-saving care to children and families in crisis with thoughtful concern, kindness and consideration. Even when challenged by urgent, life-threatening problems she takes the time to discover a family's true needs and identify their wishes and fears regarding their children. Dr. Fine has assisted families of children with severe genetic conditions to understand the medical decisions that must be made and to guide families in making difficult decisions. Joannie Ivory, M.D., an internal medicine resident, is always going the extra mile to establish a rapport with patients. She cares deeply for their well-being, and she will go out of her way to make sure that their stay in the hospital is as pleasant as possible. Dr. Ivory has bought games, books, and coffee to patients who were hospitalized for long periods of time and may not have stayed to complete much-needed medical treatments. Nathan Wilgus, M.D. : Nathan Wilgus, M.D., a pathology resident, has done a tremendous job for one of his recent patients. Wilgus and his attending went down to the operating room to perform a frozen section evaluation for a possible lung tumor. After looking at the slides it was determined that there was no cancer, but the sample was worrisome for a rare infection. He went to the bedside, introduced himself to the patient and his family, and obtained additional information that suggested the patient had an infection that could be treated with antibiotics. Wilgus went above and beyond to help make this diagnosis and reassure the family and patient. Jinhua Piao, M.D. : Jinhua Piao, M.D., is a pathology resident who is highly respectful, treating each patient, and their family members, as individuals worth of our service. She has gone above and beyond expectations to know our patients and explain how we are impacting their care. She has also been a strong advocate for vulnerable patients in complicated medical situations for which the proper therapeutic way forward is unclear. One weekend, Piao was responsible for two therapeutic plasmapheresis procedures and did a marvelous job of supporting the patients and the nurse performing the procedure, staying at the patient's bedside to assure a safe, comfortable and successful experience. Pujan Patel, M.D. : Pujan Patel, M.D., is a pulmonary critical care fellow who provides the very best care to his patients. We breathe a sigh of comfort whenever we know Patel is working in the ICU. He always says to us that he looks after patients as if they were our own family members and this shows by the respect and attention he gives the patients and families. Patel is always calm and collected, which makes both the patient and staff feel reassured. He remains humble and approachable and always listens to the nurses concerns regarding the patients. In caring for a very sick cancer patient, Patel made a point to regularly sit down with the family at the bedside to explain everything and how things were going every few hours. He also assisted a blind patient with a tracheostomy in getting resources to better communicate with her care providers. Family Medicine: Ashley Meyr, M.D. Internal Medicine: Nikhil Malhotra, M.D. an Elective Rotation: Elizabeth Billquist, M.D. Family Medicine: Steven Song, M.D. Internal Medicine: Andrea Ramirez-Gomez, M.D. Pediatrics: Mary Kate Lockhart, M.D. an Elective Rotation: Peter Boor, M.D. Family Medicine: Dillon Cleary, M.D., Noah Cooperstein, M.D., and Steven Song M.D. Internal Medicine: Andrea Ramirez-Gomez, M.D., Garrett Rampon, M.D., and Aaron Schenone, D.O. Neurology: Jeff Calvin, M.D., Neel Parikh, M.D., and Arun Solanki, M.D. OB/GYN: Cara Buskmiller, M.D., Ionana Marcu, M.D., and Joe Shi, M.D. Pediatrics: Mary Kate Lockhart, M.D., Perry Morocco, M.D., and Dajana Sabic, D.O. Psychiatry: Vikas Mandadi, M.D., Amir Mohebbi, M.D., and Sohail Nibras, M.D. Surgery: Amit Kainth, M.D., Sean Massa, M.D., and Anne Mooser, M.D. an Election Rotation: Peter Boor, M.D., Ryan Haskamp, M.D., and Alex Myong, M.D. The Office of Graduate Medical Education offers a scholarship for two faculty members to attend the ACGME course on "Developing Faculty Competencies in Assessment" each year. This scholarship is intended for residency and fellowship program directors, associate program directors, chairs and members of the Clinical Competency Committees (CCCs) and any faculty members with major responsibility for the assessment of residents/fellows. In 2011, the SLU Resident/Fellow Behavioral Health Advisory Board (BHAB) was established to share feedback and ideas regarding the behavioral health needs of SLU residents and fellows. The BHAB meets 2-3 times per academic year to discuss ideas for raising awareness of services, issues in seeking services, input on issues and relevant behavioral health topics of interest. We welcome new members each academic year! If you are interested in joining the BHAB, please email your interest to StlouisUHPBHP@uhsinc.com. The list will be submitted to the GME office who will request approval from your program director for participating.